The label Viajero Inmovil Records is a project that was created back in August 1999. It is devoted to promote and distributing the music of independent progressive rock bands from Argentina and South America. On the label you can find some fine prog releases with influences of jazz, RIO (Rock In Opposition) and Neo Classical music. This label released this year a beautiful gem from Argentina. The Buenos Aires based quartet Aletheia released in 2016 their self titled EP. The band is formed in the 2014 and is known for composing soundtracks for a number of short films. And now the label Viajero Inmovil has released their debut concept album entitled “Los Misterios De Eleusis”. The album is housed in a beautiful and original cover that includes five little artwork sheets and an envelope which includes the CD. I don't know anything about the concept and my understanding of the Spanish language is very poor. So I will concentrate on the music. But you will be in for a treat. This album which is divided into the parts “Nordenskjöld”, “Infancia Diamantina”, “Fotofobia”, “La Semana”, “Octaedro”, “Interludio”, “Mates”, “Y el verano dejo una brisa”, “Sangre de Estatua”, “Infancia Diamantina (reprise)” and “Menocchio (a Domenico Scandella)” is a little gem. The album opens with the song “Nordenskjöld” that has a dark Neo Classical intro. The name of the Belgian RIO band Univers Zero crossed my mind. But then the mood gets more bright with beautiful violin and flute melodies. The dark and light atmospheres are following each other and there are also jazz fusion and chamber music parts in this wonderful opener with an overall dark atmosphere. The end gets freaky and complex with sax, flute and guitar solo's. The last part of the song will be interesting for the fans of Änglagård. Yes, I have your full attention now. “Infancia Diamantina” opens with a lovely fairytale like flute tune. But then the bright colors are infused with some darker parts. But in overall the atmosphere stays light with beautiful guitar and flute parts. “Fotofobia” has beautiful violin melodies and has more Neo Classical influences. The song develops into a diverse composition with breathtaking melodies and freaky King Crimson influenced parts. At one point it is like you are listening to the “Red” album of King Crimson. It is a nice ode to this amazing band. But then the band comes with delicate piano and violin melodies. The diversity in the songs is immense. The song develops into one of my favorite compositions of this remarkable album. The melodies are often just breathtaking. The fretless bass and the sax in the next part “La Semana” are providing the jazzy elements but you can also find a beautiful violin part in this track. “Octaedro” has beautiful electric guitar and flute parts but has also a more Rock oriented part. On the other hand the ending is keyboard dominated and symphonic. “Interludio” is a short acoustic guitar interlude that flows into the part “Mates”. The uptempo first part has a synth solo and King Crimson like guitar work. The middle section sounds light with beautiful bass and flute melodies before the King Crimson influenced guitars are returning and the tension of the music is building up towards a kind of climax before a synth solo is ending this part. “Y El Verano Dejo Una Brisa” opens with a delicate acoustic guitar and has beautiful oboe and clarinet melodies. “Sangre De Estatua” has more uptempo and uplifting parts but you can find also nice and brooding synth melodies in this track. After the classical guitar and the female voices in “Infancia Diamantina (Reprise)” it is time for the last and longest track of the album. It is called “Menocchio (A Domenico Scandella)”. In overall it sounds very classical with acoustic guitar, flute, oboe and clarinet parts. This song is divided into the parts “El queso y los gusanos”, “Menocchio”, “Su voz se eleva”, “Sobre hogueras de horror” and “Menocchio (reprise)”. It is also the only song with a (female) vocal part with lyrics. I am now talking about the Menocchio parts. It is a worthy closing of a remarkable album. 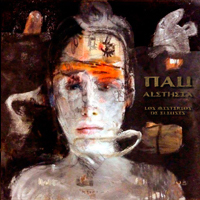 The debut album “Los Misterios De Eleusis” from the Argentinian quartet Nau Aletheia is a little gem full of beautiful themes and melodies. Because of the diversity in the music, it is for a reviewer difficult to describe their music. I think it is an interesting mixture of Classical, dark Neo Classical, Jazz fusion and Prog. This is a real progressive rock release for the open minded music lover. Highly original music with some little references to bands like Univers Zero, Änglagård and King Crimson. You can find those references in the very strong first part of this album. The second part of the album is more classical and jazz oriented. I am very curious about the development of this band. For me this album is one of the most surprising albums of this year so far. Highly recommend to the open minded music lover.